Glebe Point YHA i Sydney, Australien: Reservér nu! A 48 hour cancellation policy states that bookings cancelled within 48 hours or are a no show are charged the first nights rate. An eclectic slice of the bohemian, art-loving, coffee-consuming, book-devouring centre of Sydney - this is Glebe YHA (and we don't mind the odd drink too! ), and we even throw in free, fast Wi-Fi all throughout the property! This hostel is a personal, relaxed & comfortable place, with friendly local staff who go out of their way to make your trip even more enjoyable. With it's perfect location in Bohemian Glebe, situated close to Darling Harbour and the city makes it a great base away from the noisy hustle and bustle of the Sydney CBD. 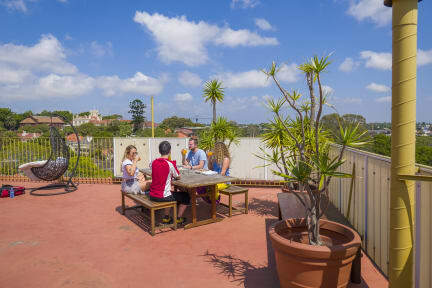 Perfect if you're a Working Holiday Maker or just want to take your time in Sydney. Bed linen is supplied and there is also a laundry for guests to use and lockers to store your luggage. Weekly and two week rates are available, please contact hostel directly for more details. Our 4 star hostel is very popular for those who like a more settled and entertaining hostel that also offers high security, cleanliness, and the best of backpacker facilities. The large rooftop with great city views, BBQ area & sun lounges is a great place to unwind and meet your fellow travellers. Enjoy the big TV/movie room and games area with pool table. Feast in our fully-equipped self-catering kitchen and dining room. Check out our well-established jobs board and car sales/notice board. We also have a day tour desk with heaps of information on what to see or do in and around Sydney. Just ask our staff who know all about the area and will be happy to help you choose and book the right activity to suit you. Cancellations with less than 48 hours notice, including no-shows, will incur a charge for the first night's accommodation on your credit card. No charge for cancellations with more than 48 hours notice. 24 hour access. Reception: 7am - 11pm. Check-in available until 2pm for pre-paid accommodation.